Okay guys. Welcome. This is Behind The Trades Episode Four. 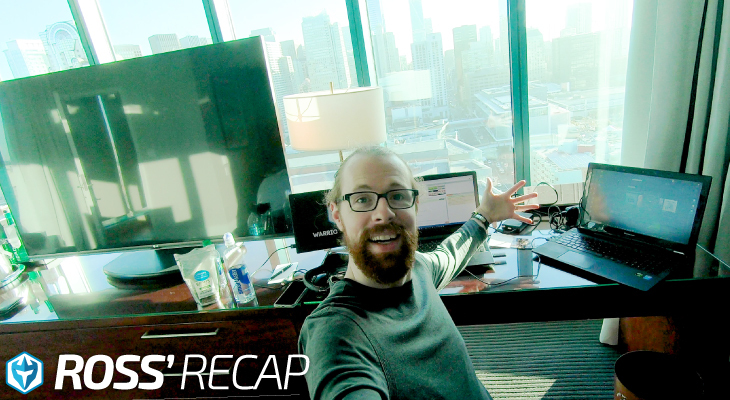 Today’s topic, Three Lessons I Learned For Making $60,000 in one month. That was $60,000 in my small trading account, which was absolutely ridiculous. This was part of my journey from taking $583 and turning that into $100,000 so in one month, to make 60 grand, really at the very beginning of that journey was absolutely incredible. Today we’re going to talk about some of the stats from that month and a few of the lessons I learned having really what was the very best month that I’ve ever had on record. It was fantastic, but we’re also going to review my weekly stats. 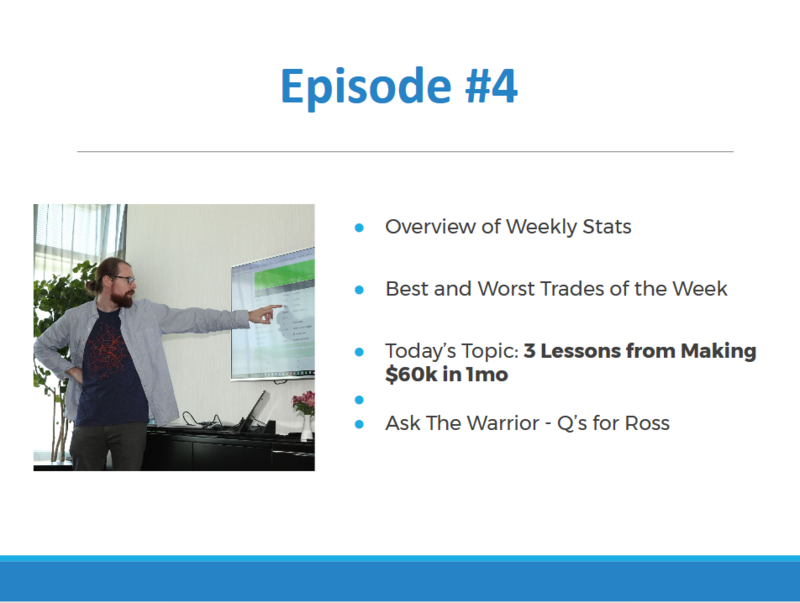 We’re going to talk about the best and worst trades this week, where I finished this week, and then of course at the very end, we’ll have Q&A, Ask The Warrior, so you can ask me questions, tell me about some of the things that you did this week, whether they were great trades or bad trades, whatever the case may be. We can have a nice little Q&A session at the end. Well, if I can make $5000 for the next four weeks, from March 6 through the 31st, that’ll give me $20,000 and I’ll be at $100,000 by the end of the month. That’s my goal. Now, if I can do it sooner, well then that would just be awesome. I would love to do it sooner, but if it does take me the full month, then that’s fine. That would still have me taking a $583 starting balance and turning it into $100,000 in three months. My accuracy this week, 61% and the interesting thing here is that I had seen a little bit of a dip in accuracy. 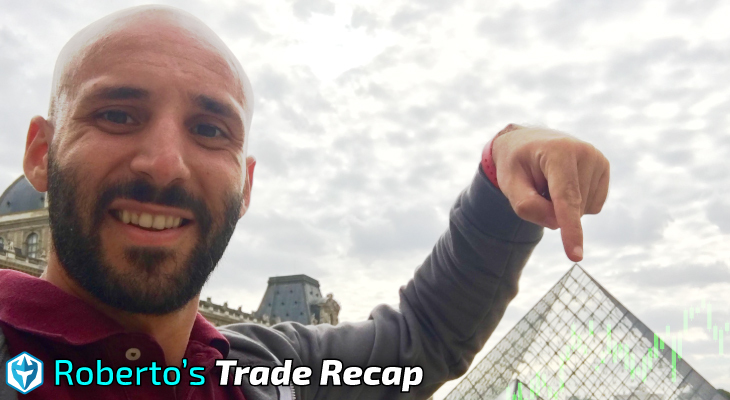 We’re going to be talking about my worst trade of the week which was actually, when we go over it, it was more than just one trade. It was actually five consecutive losing trades back to back to back to back to back, which is of course disappointing and maybe even a little embarrassing, and that definitely drew down my accuracy this week, so down to 61%. Average winners, 14 cents per share. Average losers, 9 cents per share. This is the good news. 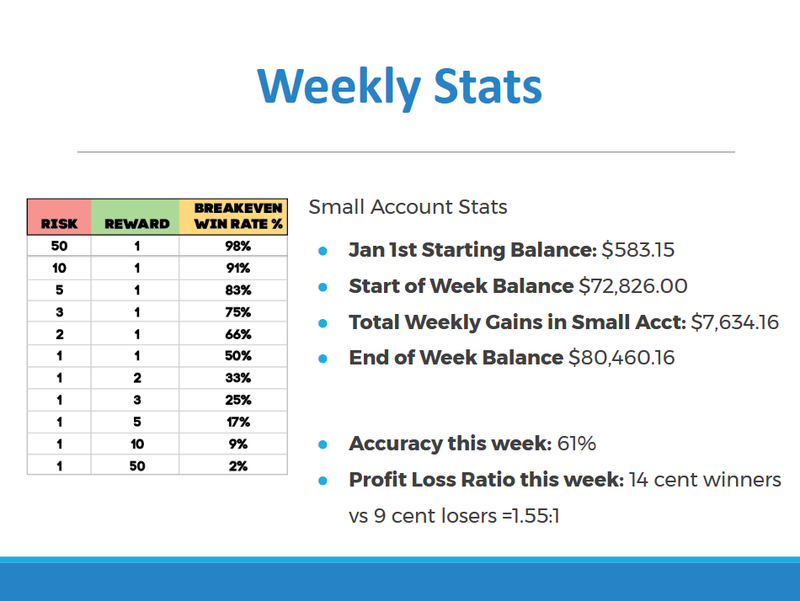 I’ve got a 1.55 to 1 profit loss ratio and if a trader or one of our students came to me and said, “Ross, these are my stats, 14 cent winners, 9 cent losers, 61% accuracy,” I would look at that and I would say, “This is really good.” Those are metrics that are sustainable. You can make money with those metrics, but if you want to make more money, you need to do one of two things. One, make the losses smaller, or two, try to get the winners to be a little bit bigger because you really want to get closer to 2 to 1. That would be the first thing you could focus on. The second thing you could focus on would be improving accuracy to get it closer to 70%, but honestly, 70% is very very accurate and most traders don’t get there. In fact, most of our students, they start around 30% and our goal is to get them to 50%. 60%, anywhere between 58 and 68%, those are the statistics of profitable traders. For me, 61% is maybe a little low, but even at my best, I’m probably only around 68 or 70%. Now, we’ll go over all the trades for the month of February of course, just a moment. I’d have to pull up my stats to see where I am year-to-date, which I will check because I am curious now that I mention this to see my accuracy since January 1st. I think 61% this week is a little bit of a dip in my accuracy, so I’ll put this in for January 1, 2017 through March 2, because I don’t have today’s trades uploaded yet. All right. We’ll filter that and let’s check the detailed analysis. Okay, so since January 1st, my accuracy is 75%. Yes, this week is a little bit of a dip. That 75% is actually a little bit better than I expected, so that’s good. That’s something that you could definitely strive for, but I wouldn’t … You can be profitable at 65%. 75% is maybe near the top, getting to 80, 85 is almost unattainable. The important thing is that, and we talk about this a lot, I’m making money but I make a lot of mistakes. You don’t have to be right 100% of the time. Being a successful trader is not about winning every single trade you take. For me, it’s about taking ten trades and winning six of them. 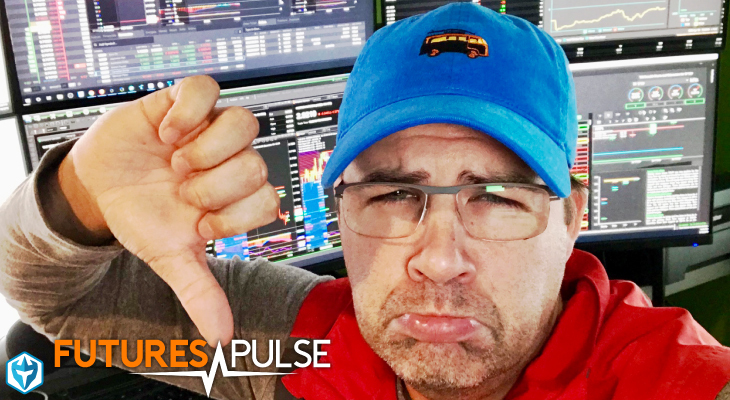 Losses are going to happen every single day, and I hope you guys have checked out my recent video from my trip to Jackson Hole Wyoming where I went and filmed Skiing with Ross. I was talking about the fact that you will fall when you go skiing if you’re pushing it, and you’re not having fun if you’re not pushing it. You got to push the edge and really have a good time out there. I fell probably half a dozen times. Did I get hurt? No. I fell in controlled ways. I knew my limits, but I was testing the edge of the limits. I took a couple falls, but that was no big deal. I had a great time. That’s the same thing with trading. Yes, you’re going to have some losses. That’s not a problem. You don’t beat yourself up for having a loss. You learn from the loss. It helps you become a better trader. Sometimes you have to implement new rules and make some adjustments to prevent repeating the same mistake, but generally speaking, having a loss is not a problem. It’s not something that should get you bent out of shape or get you frustrated. It’s just part of this job. Finishing the week with 61%, maybe a little lower than I’d like, but the big picture is, that’s fine and I’ll just, next week, strive towards trying to improve that a little bit. When we talk about the worst trade of the week, you’ll see how five back to back losers certainly don’t help you with your statistics and your accuracy. 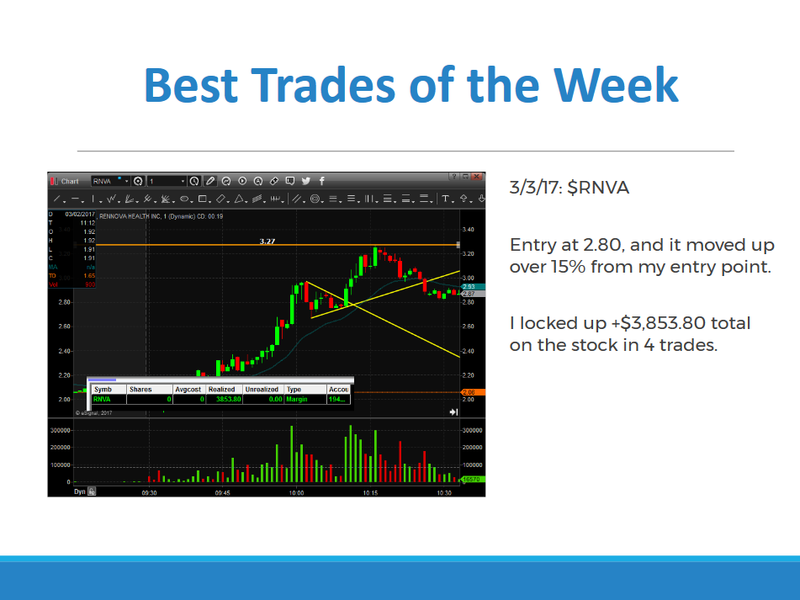 The best trades of the week, well that would be my trade today on RNVA. This really was the best trade of the week. Not only was it my biggest dollar amount winner of the week, making $3800, it was also the cleanest setup, a super clean A, B, C, D pattern that we talk about a lot in the classes. We have this squeeze up here on the one minute chart, the pull back to point A, the popup to point B, the pull back to point C, and now your entry is a break of point B with a stop at C. It’s that simple. Enter here, stop is here, target is high of day, first target, and then looking for a breakthrough high a day. I really like this setup because you can very easily visualize your max loss and your profit target. A trade is not a trade until you know what your loss and you know what your profit target is. Until then, you’re just basically gambling. You need to have those two points in order to really get a sense of whether this trade is even worth taking. If your profit target is 100 bucks and you’re risking 500, it’s not worth taking, but so many beginner traders jump into positions not knowing profit targets, not knowing max loss, and then of course they wonder why they’re losing money. 90% of traders out there will fail, so you really have to think about what they’re doing wrong, and what you’re going to do differently so you don’t become part of that statistic. For me, as you guys know, it took me years, well certainly years to get to where I am today, but years even to get to the point where I was having any degree of consistency and of course confidence. Those two go hand in hand. This trade here, I took a total of four trades on the stock. I had two … I actually had one really good winner, probably $2600. I had a $500 winner, a $400 winner, and like a $200 winner, so it was just generally a nice easy stock to trade. From my initial entry right here at 280, it went up 15%, so I feel good about that and if I could trade setups like that every single day, well I guess I’d be making $3800 a day. The unfortunate thing this week is that good setups were just hard to find. 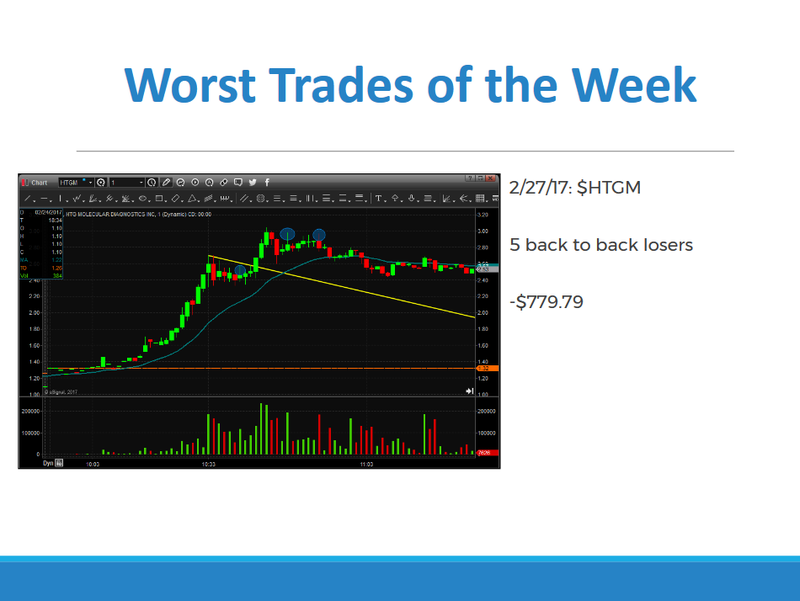 I may have gotten into forcing setups a little bit, forcing trades, here you go, on HTGM. I’m the guy who managed to lose money on a stock that went from $1.30 to $3 per share. I took five trades and lost each time, five back to back losses. At the end of it, I was starting to think about throwing my computer out the window because I was like, “This is getting ridiculous. I don’t even know what to think at this point. Every single time I go into this trade, it goes the wrong direction. How am I not seeing this setup? Where is the disconnect?” I’m not usually, I don’t usually have that problem. In fact, five consecutive losers is the longest red streak … Actually, it may have only been four, but in any case, it’s the longest consecutive red streak that I’ve had this year. I don’t usually have that many back to back losses mainly because at a certain point, I just give up. I’m like, “Okay. I call quits. This setup’s not working. I’m not seeing it clearly,” but for some reason on this one, I just really wanted to make it work. You could see these blue circles here were some of the fake apps that we saw. First candle to make a new high, nice setup and then we go right back down to the low. Then we break out, so choppy there. Then first candle to make a new high, we squeeze up and then we come all the way back down. Again, we start to get a break out and then a hard rejection. This is just a stock for whatever reason it was just really heavy. Now, that brings up an interesting point which is that this week we just really didn’t have the same degree of follow through and momentum that we’ve had, I guess, both since January 1st, so what’s up with that? Well, I think one of the things here is the fact that when we have a market that’s really strong and we’ve got a lot of momentum, you have to recognize that the market is driven by collective mentalities, really the group mentality of all traders, of all investors coming together to either form long biases or short biases on stocks, [inaudible 00:12:18] and commodities. You multiply that mentality over thousands, hundreds of thousands, maybe millions of traders and investors, and you start to see these really exaggerated moves, these big squeezes to the upside. At a certain point, short sellers begin to recognize this pattern as well, that the long bias traders are jumping in these stocks become irrationally strong and then they roll over at the very top and they come back down sometimes just as quickly. That, for short sellers, provides an opportunity. I think both long biased and short biased traders have probably loved the first two and a half, two months of 2017 because of the amount of volatility that we’ve had, great opportunities on both sides, whichever your preference or bias may be. The fact is, when you get the point where short sellers start piling in earlier and earlier, it’s almost like the opposite because when you have got the long biased traders, we get in earlier and earlier and earlier and create these moves. Then short bias traders start shorting earlier and earlier and earlier because they are anticipating that reversal, so now you have more and more people coming and putting a cap on this momentum. This isn’t a way to market self-correcting, coming back into balance, but guess what? We’re going to get to a point where we have a stock that pops up and traders start to short it, but what they’re not going to realize is that this stock actually has a really good catalyst, or maybe has a big hedge fund trying to take a huge stake of it on the open market. Maybe they’ll announce later in the week that they’ve taken a 15% stake in the company. You never know what causes these, but something will cause the stock to start to pull back and then to rally, and now these short sellers who shorted early are going to be covering as the stock starts to squeeze back up. Long bias traders sensing momentum are going to jump in and now you start to get these big waves and these big extensions starting again. Eventually, they will slow back down. Right now, we’re in this little bit of a lull in between these waves, in between these cycles. Certainly DRYS, GLBS, the Shipper stocks created, perhaps the momentum that’s carried us even into January then at start in November. We may be coming to the end of what has been the longer hot cycle and things might be slower for a couple of weeks while we wait for that next stock that really sparks the interest of traders, that just goes from 0 to 100 or whatever it is, that just goes crazy. Here’s the thing. While we’re in between these cycles, when we’re in that lull, you have to be able to be mindful of this place in the market. This is not the place to be incredibly aggressive. This is a place where we’re going to see more stocks like HTGM that are just really choppy and that are not clean. Definitely that’s what I was sensing on, I guess that was Monday when I traded that. Then going into Tuesday wasn’t much better. Wednesday, Thursday, Friday, finally today we got this nice opportunity on RNVA. I think RNVA has some potential to carry over into next week, potentially. We’ll see. We’ll definitely keep it on watch, but in any case, next week in order for me to continue to have some really solid trades, I need to stay focused on two things. Number one, I need to be focused on trading pullback entries only. Buying the pullbacks, which this is a pullback, this just didn’t work, but buying the pullback entries with a stop at the low, and not chasing stocks into the highs. Also remembering the “Three strikes you’re out,” rule, if I try a stock three times and I lose three times, I just call it quits. You don’t need to go back in for the fourth, fifth, sixth, seventh loser. Just at a certain point, throw in the towel. The good news on HTGM is that I only lost $779, so I didn’t get back thousands because I was keeping relatively tight stops, but I just wasn’t seeing follow through. 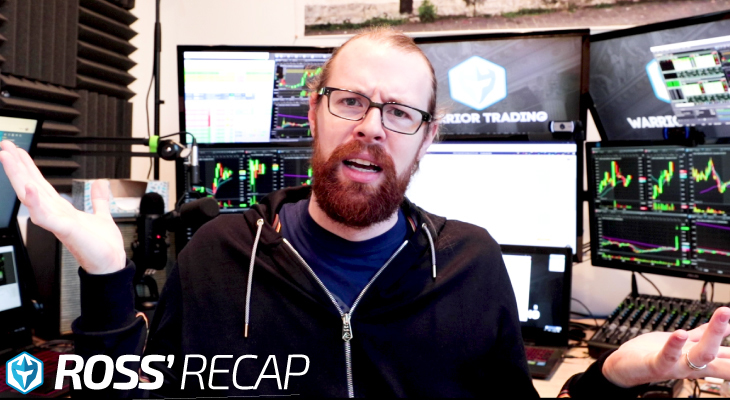 All right, so now with the overview of today’s or the trades from this week behind us, let’s talk a little bit about the three lessons that I learned from making $60,000 in one month. Again, that was the biggest month that I ever had. January was the biggest month that I’d ever had. I made $41,000, $42,000, but I was up $55,000 and on the last day of the month, I lost 13 grand. How frustrating, right? So I already had it in my mind that I had broken 50,000 on the month and how awesome that was, so finishing the month with 42,000 actually didn’t feel like a victory. I think it made me even more aggressive coming into the month of February, finishing the month of January and then coming into the month of February. The three lessons. Number one, when the markets are strong, you have to be aggressive. Number two, learn to tolerate the big losses and bigger losses. Number three, wait for the pullback entry. Those are the three lessons that I learned, and I’m going to talk specifically about each one of those lessons, but let’s first break down my statistics for the month of February. I will be, of course, uploading my statement for the month. That’ll come in, usually it’s four to five days after the new month starts so I should have that statement as early as next week. I checked today and it’s not uploaded yet, but that’s fine. I’ll upload that to the website. In any case, I’ve got my Trader View stats and those are posted on the website. These are what my metrics look like here for the month of February. I had five red days and I took off two days. Well, one day was President’s Day weekend. This was on that Monday. It was a bank holiday. Markets were closed. Then this Friday, I was flying to Jackson Hole, so I took the day off. You notice a trend where I do pretty well at the beginning of the week. Then the end of the week, not so well. On this Wednesday, I didn’t do so well. Here are the stats. You can see this is that equity curve, starting, moving up, the little bit of pullback, up, pullback, up, pullback. The tough thing for me was that on the 9th, was the 9th … yeah, I think it was the 9th and the 10th, I lost in those two days over $10,000 or right around $9000. That was a pretty big losing streak for me to have. I haven’t had … I don’t usually have back to back red days. I had two of them in February and those two days obviously were a pretty big draw down. I was feeling nervous because I was thinking, “Look. It’s just not acceptable for me to lose $10,000 in two days. If this keeps happening, it’s going to be a problem. I can’t have red days that are this red.” I was definitely feeling a little bit concerned. I was also feeling frustrated because I had gotten myself such a nice cushion on the month of February, especially at the very beginning of the month, and then here it felt like I was taking a pretty big step back. That’s definitely not what I was wanting to do, so I was a little bit disappointed there but then I rebounded on Monday and Tuesday with two back to back $8000 days, so I lost I think 4000 here, 5000 here and then I made 8000 here and 8000 here. Then I had a red day and lost maybe 1600 bucks, or something like that, 1700 bucks. Then bounced right back to another green day, another green day. On this, this was the week where I made $20,000. Obviously that was a great week. The week before that had been pretty good, and the first few days of February were absolutely ridiculous. You can see how my gains did sort of decline as we got towards the end of the month. I said, “Let’s just try to keep this in control, paperback a little bit.” That’s what I did, and so I started to rebound a little bit but I wasn’t being quite as aggressive. At the same time, this was sort of the beginning of what I felt has been this kind of lull in the market where I had this little pullback and I’ve kind of been double topping at these areas for awhile. All right. Now, you can see my daily volume has been fairly high on the days when trading has been going well. Definitely trading larger size and that’s resulted in these bigger winners. These are the statistics here. Total gain for the month of February, $60,856.18. Now, the Trader View stats do not include a couple things. Number one, they don’t include platform fees. Number two, they don’t include wiring fees. Number three, they don’t include TAF fees. 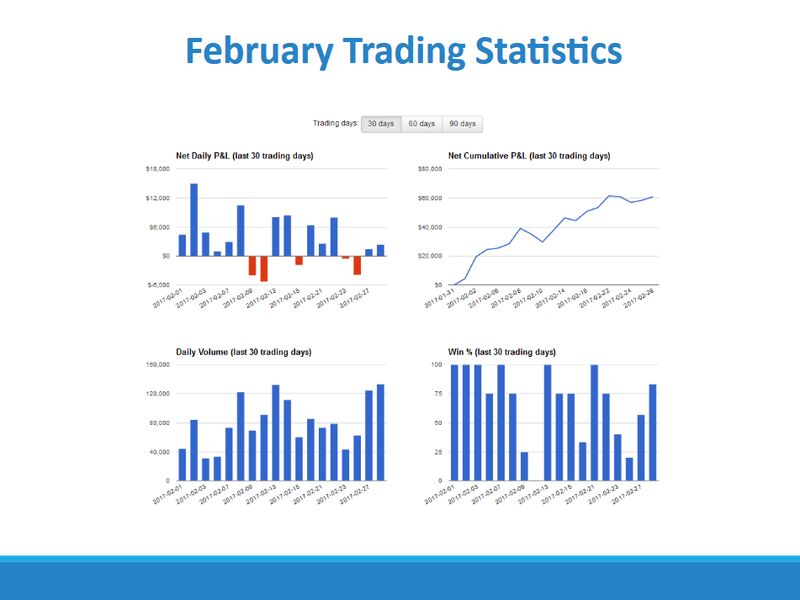 These statistics will always be a little bit higher than my actual broker statement because of those three things that are not included, but these are of course the results of all the trades that I took in February in the gains, so a total of 70 trades with 68% success. January was better in terms of my accuracy. Because I was at the very beginning of the challenge, I was being much more, I think, diligent about taking the best quality setups. In February, I think I fell into my groove. It was like, “Look, I don’t need to win every trade. I just need to be aggressive on good quality setups and I definitely had some trades where I went from being up several thousand to being just break even. Single largest gain, $10,200. Largest loss $5,357. Average winning trade, 1800 bucks. Average losing trade $1300, which is not bad. These are big numbers, but in terms of profit loss ratio, that’s not bad. That puts me a little less than 1.5 to 1 which is kind of what I expect. Average hold time on the winning trades, 11 minutes. Average hold time on the losing trades, 13 minutes. My max consecutive losses is showing a four, so I must’ve been four trades on HTGM instead of five, although I thought it was four. I think actually what it might’ve been is that I took a trade in between those two and it was LJPC, so that broke the streak but in any case, I still have five losses on HGTM. I’m pretty sure it was five. Total commissions for the month of February, $1300. Total ECN fees, just under 4000. Now, February stats are divided between two accounts. I traded for the first six days in my SureTrader account. Then I traded for the rest of the month, from the 7th on, in my SpeedTrader account. You’ll see the way I’ve decided to break this down on the website for my 2017 earning statements is I’m just putting the entire SureTrader challenge into one place, so basically, and let me just pull this up so you guys can see this, let’s see, so you can see here January 1st through February 6th was the SureTrader challenge, 24 days, $583 to 42,000. Then those are my broker statements. Then February 7th to February 28th, starting balance $41,898. Ending balance $76,000. This is the amount that I made just in my SpeedTrader account in February, so I’ll be uploading that statement as soon as I get it. All right, so let’s see. Now, as you can see with these trades, my accuracy was pretty solid. For the most part, that’s attributed to the fact that I was trading the good quality setups. I was trading the bull flags, the flat top break outs, the ABC setups, and I was predominantly trading to the long side. This right here is my Trader View account that you guys can see for those of you who are watching in a chatroom or on YouTube. Let’s see. I want to go through these stats a little bit more with you. This is interesting. They have this tab called “Win versus loss days” so the winning days here for the entire month total $80,000. The losing days, which were five losing days, were $14,000 in losses. That’s the way it breaks it down. Then you can see your average success based on whether you’re having a winning day or a losing day. On my winning days, I had 80% accuracy which is fantastic, but then of course the other side of the coin. On the losing days, my accuracy was only 36%. I think this really speaks to the fact that I’m either hot or I’m not. I’m either having a really good day and I’m hitting my daily goal and it’s just great, or the market’s not on my side. This is also, I guess this is good to see that that is why I have losing days is because my accuracy is just really poor on those days. It’s not a profit loss ratio issue specifically. It’s really just the fact that my accuracy is bad. The winning trades the whole time is much shorter probably because the winners are very small gains. I get in, it doesn’t work, and I get out. The average losing trades on both sides are about 14 minutes. Now we can see, let’s see, if we look at … Let me go back to detailed for a second. Let’s look at, as we know performance by day of the week, Friday’s were my worst day of the week for the entire month. I lost a total of $3600 on Friday’s. Wednesday’s were my best day of the month. All my positions were [intraday 00:29:19] and performance by intraday duration, the majority of my gains were on trades that I held, this says 20 minutes to 29 minutes. I guess because there were some trades that I got into that I held a small position a little bit longer, those ones ended up working pretty well. I do remember a couple of trades that were losers that I held for awhile, and then finally ate the loss. It looks like maybe I have one trade that I held even longer than that, although I don’t remember holding a trade that long. I’m not sure what’s up with that one, but maybe it was a small position or something. Then we can also look at, and this is a really, this is an awesome platform, you can import all your trades direct from your broker into Trader View. Then you can see all these metrics. It really is, you gain a lot of insight into your trading metrics, what’s working and what’s not working. Let’s look at … Let’s see the instrument here. The stocks that were my top 20 biggest winners, my top 20 biggest losers, RESN and QBAK, those are my biggest losers. Interestingly here, performance by instrument volume. A lot of traders think that I’m trading lower volume stocks, but in fact, the majority of my profits were on stocks that had more than a million shares of volume. I had some profit, 7800, from stocks with 250,000 shares to 500,000 on the day, but the majority of these profits were on stocks that had higher volume, although not much on stocks with more than 25 million. Performance by instruments, relative volume again showing you that almost all of my trades are way way way high relative volume because that’s what we’re looking for. Stocks with high relative volume, they’ve got a catalyst, they’ve got a reason to move, whether it’s a technical break out, fundamental news, whatever. Those are really important points to take note of. That really is where I see the biggest gains. Then, let’s see, so I think that pretty much breaks down … Oh, let’s look at market behavior. This will be an interesting one too. Market behavior, trade distribution by spy movement, so for the most part, I guess we didn’t have any days but you can see performance by spy day type. Outside range, inside range, and then trend up. I’m not sure exactly what the trend up means, but I have found that statistically I don’t do as well when the market is really, really strong. For whatever reason, I do better when the market is either sideways or down slightly, I do better than when the market’s up a lot. That’s a break down of my statistics for the month of February. I know some of you guys really like to see those metrics and stuff like that, so that may be more in depth than some of you care for, but I think for those of you that do like those metrics, it’s appreciated. Anyways, those are the metrics. Now, lesson number one of these three lessons I learned. When the markets are strong, be aggressive. Here’s the deal. You trust the setup, you be aggressive and you maximize on the opportunities. By being aggressive during the hot markets, you can afford to sit on the sidelines during cold markets because you built up such a cushion and that’s exactly what I’ve been able to do this week is feel like, “Look, I made $68,000 last month.” 60,000 in my small account, 8000 in one of my other accounts, finished the month with 68 grand. I was 100% pushing as hard as I possibly could around the corners, the wheels are squealing. When I would come into a corner, I would slam on the breaks almost as hard as I could. Obviously you want to be able to feather and be gentle, but you’re really pushing as hard as you possibly can to get that extra tenth of a second or second or whatever it might be to your lap time. I think I’ve applied that to my trading, to be aggressive, to really push the edge of my limits. You know what? It resulted in the best month I’ve ever had. Now, during that month, did I have some red days? Yes. I did. I had days that were really not very fun where I lost $5000 but on my green days, I crushed it. That’s the thing. This is obviously not like driving a car where I’m risking crashing into a wall and getting seriously injured. I’ve got a much better sense of my max loss on trade, 4 or $5000. Yes, that’s bad, but I can handle it. If that’s the risk to potentially have a day where I make 8000 to 12,000, it’s worth it, so that was one of the big things that I learned because I think … I’ve been trading for a long time and there’s been a lot of strong markets where if I applied the mentality that I had this month to those markets, I would’ve made a lot of money, but I wasn’t at that time being as aggressive. I didn’t have, at that time, as much confidence to take these types of large positions. This is something that does come with experience, for sure, but it’s just to say that if you have the presence of mind to recognize that we are in a very strong market, and that this is a good time for you to try as best as you can to make the most of it, I think that that will help your trading. Then the other side to that is to recognize we’re in a cold market right now. 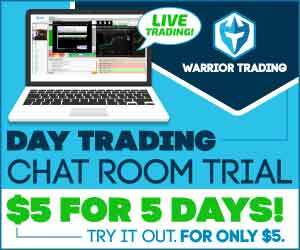 For some of you, this was your first week joining the Warrior Trading chatroom and you’re like, “Wow. Trading is so slow. There’s nothing going on.” This may be, you may try to be aggressive even though it’s not the right time. You just have to recognize the time will come when you can really step up to the plate and spring for the fences. There are other times where you just have to step back and ease off the throttle a little bit. 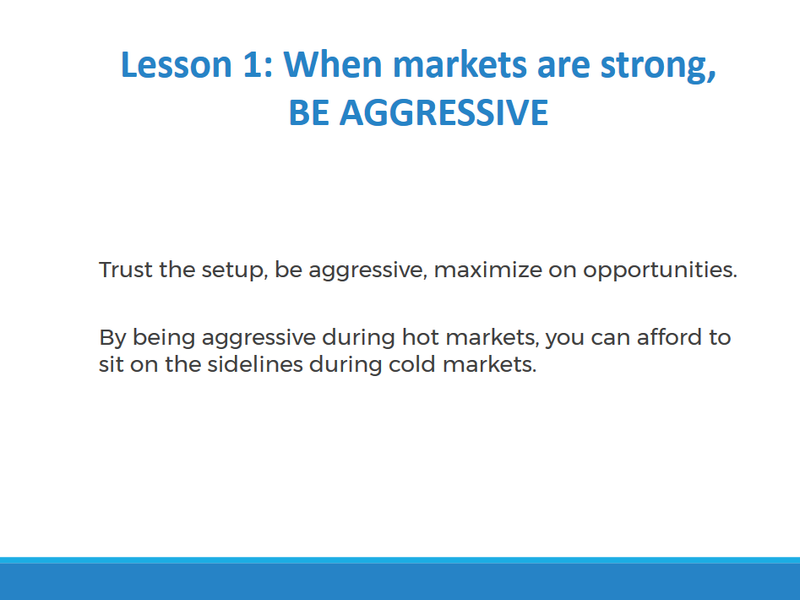 Number one lesson is when the markets are strong, be aggressive. 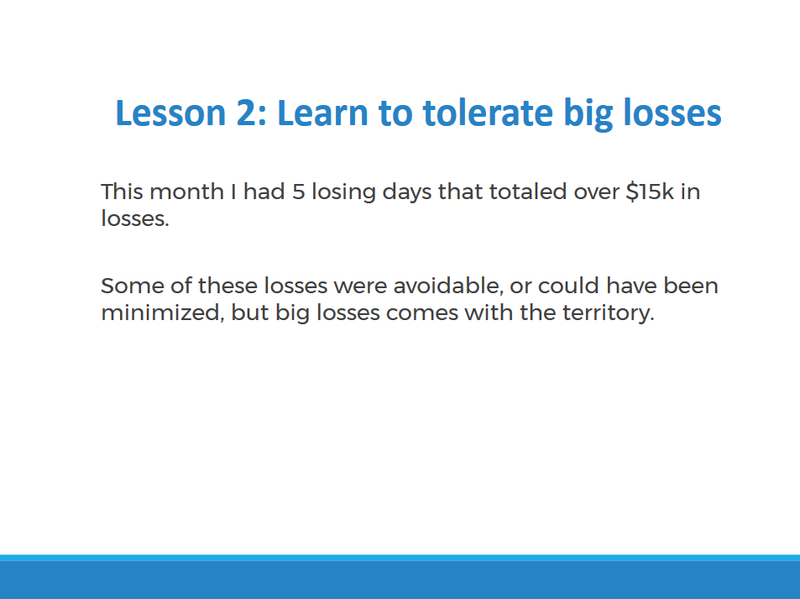 Lesson number two, learn to tolerate the big losses. This month I had five losing days that totaled over $15,000 in losses. This year, I’ve made over $200,000 in winning trades and I’ve lost $100,000 in losing trades. The net is that I’m still up, I think on the year right now I’m up around $114,000, so it’s been a good year but there have been some big losses. You have to learn how to tolerate those big losses without it effecting the way you trade. This is one of the biggest challenges that traders have. It’s a battle with your own emotions. We talk about this in a lot of classes in the Warrior Pro class, we talk about it in the chatroom, battling your emotions, learning to become comfortable with experiencing loss and really with experiencing discomfort because having a loss is never something that you want to have happen, it’s not something that you enjoy but you have to learn to be able to sit with it and experience that discomfort. It’s like maybe laying down on a bed of nails or something and you just kind of have to find a place where you can go where you can allow that discomfort to be there without acting on it. Meditation is one of those things, exercise is one of those things. Exercise is not a fun thing. Maybe some people like to do it, but I don’t like to go to the gym. I don’t like to exercise. To do those things is forcing me to be uncomfortable, essentially is what it’s doing. The good news is that by forcing yourself to handle the emotion of discomfort, with practice, you get better at it. Then when you’re in a trade that’s going the wrong way and the thing you really want to do is just hold it and hope that it’ll bounce back, instead you do the uncomfortable thing which is just cut the loss, or you’re in a winning trade and you feel a little uncomfortable because you just want to take the money off the table but you work through that feeling of discomfort to hold the trade until you get an exit indicator and then that’s how you end up having the bigger winners. So many traders fall into this habit of small winners and big losses, and that’s really driven by emotional trading. I say that because I’ve been there. This is one of the reasons that I enjoy working with students so much and talking about these things because I made every single mistake that there was to make before I found any success at all. I’m not someone who came into the market and made a quarter million dollars in my first three months. I didn’t have any success. I saw people out there making money and I was striving to achieve it, but I just couldn’t get it. One of the big struggles for me, I had the basic struggles because I didn’t go through a class so I had to teach myself the right type of stocks to trade, how to manage risk, how to find setups. All of that stuff you can learn though. I just learned that the hard way, but the things that I really struggled with were the emotions and learning how to control those feelings when I was having a bad day. Learning to tolerate the big losses, because once you can tolerate them, then you’re in a position where you can scale up. If you want to have a month where you make 40,000, 50,000 or $60,000, you need to be able to handle a day where you lose 5 grand and not go out and get really upset or frustrated or whatever. You just, it’s another day. It’s no big deal. You’ll bounce back tomorrow, so wherever you are, a big loss for you today might only be $100 or 150, and that brings out those same emotions that maybe a $10,000 loss would bring out of me. We all are at different places in this learning curve and it’s okay to be where you are, just make sure you’re mindful of the fact that testing the edge of your limits is the way that you’re going to grow. You start to think that, when you’re on a hot streak, that anything you touch turns into a winner. The market will remind you very quickly that that is not the case. The market will remind you that, “No. I’m stronger than you, and this stock, you’ve gone in too high. 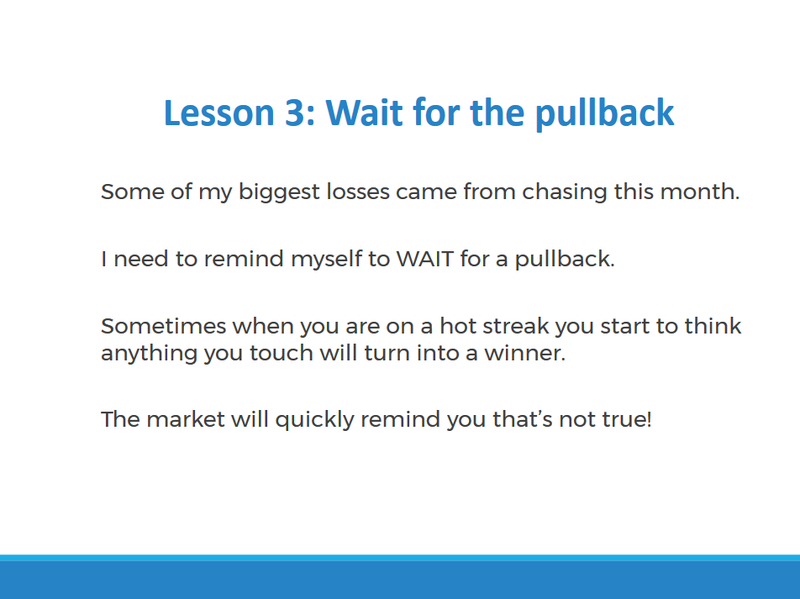 It’s dropping down 30 cents and you’re going to lose 5 grand on this trade.” Waiting for the pullback, this is something that’s important for me, but it’s also important, and maybe especially important for each of you because you’re in an environment where you’re seeing someone else take trades. I take these trades because this is an opportunity for me to teach you everything we talk about in the classes to teach you in real time but there’s that instinct that some of you will have to try to follow me, to try to chase the stock that I got into at a better price because I got in at the right price. You really have to fight against that. This community is not about following me, it’s not about following any of our moderators. It’s about learning why we take the trades I take. The trade I took today on RNVA, there was a proper entry on that stock. Although even on my trade, which you’ll see when you watch the live recap, even though I did chase it up a little bit on my own trade, it’s because of course I was looking at the $3 target and then the break over 3 and that made sense. You want to make sure you understand the reason you’re getting into a trade, not because someone else says something or whatever it might be. Whether it’s me or anyone else out there, you get in because you understand the setup. That’s about me teaching you how to become an independent trader so you can be doing this on your own for the next 10, 15, 20 years. If you want to be in our community, giving back to the community, exchanging the ideas that you have, sharing setups, stuff like that, then that’s great. That’s what’s helping build this community to the point that it’s at today, but if you want to trade on your own or you want to decide you move to Japan and you want to trade in the Japanese market or something like that, it’s a better timezone, then you can do that on your own and you don’t need me there. This whole idea of waiting for a pullback is essentially waiting for the setup to form. If you’re getting into a trade and there’s not a setup, you’re setting yourself up for loss. One of the things that I would suggest you guys do for the month of March is that you set goals. Now, we’re already three days into the month but doesn’t mean it’s too late to set some goals. Now, along with the goals you set for the month, you should have a couple sets of rules. Those rules should probably include your max share size, the type of price stocks you’re going to trade, the time of day you’re going to trade. For me, those rules include, I’m really only going to trade until lunchtime, 9:30 to lunchtime. I don’t think I’ll trade pre-market. I can say that I won’t but I don’t really have … I don’t feel the need but I highly doubt it. I’ve traded pre-market maybe half a dozen times in the last year, so probably won’t trade pre-market. I’ll just trade 9:30 to noontime. I’ll be trading stocks primarily priced between $3 and $10. On those stocks, I’ll probably max out share size at 20,000 shares. I don’t think I’ll be in a place this month where I would take more size than that unless we get into a really good hot streak again and I’ve built up my cushion. If I was going to take that kind of size, I wouldn’t be taking it all in one go. I would be adding to the position, so I would already be up 20, 30 cents on 20,000 shares before I add that extra 10,000. I’d have to be very careful because look, if you lose 30 cents on 30,000 shares, you’re down 9 grand. When you get slippage trying to market out of a position like that, you lose another 20 cents easily, you could lose $15,000 like that. I will respect the danger with that level of share size, but I’d encourage you to add some of those rules and then I’d also encourage you of course, track all of your trades for the month in Excel Doc. 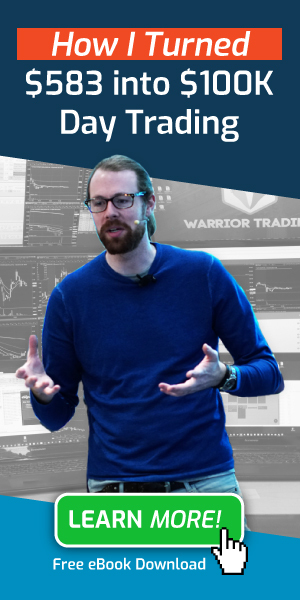 For those of you in the Warrior Pro course, that will be something that I’m able to look at and then I’d also suggest that you take a screenshot of your trades, every single trade you take. You should probably only be taking three to five trades a day, not more than ten. You take a screenshot every day of these setups, and you want to be able to look back at that setup the next day or a week later and say, “Yep. That was a good trade.” I know that I’ll be able to say that on RNVA because it’s a fantastic trade. It’s a great setup. I won’t be able to say that about my trades on HTGM. I won’t be able to say that about some of the bad trades I had this week, so it’s a reminder even to myself to be patient, to wait for those good quality setups. That’s what I did in January. That’s why I had 80% success in January. I was much more selective about what I was willing to trade. I was at a point where I was at the beginning of my challenge. It was very important that I built up my cushion and I didn’t make big mistakes, and so I was more selective. February, I eased up a little bit. I just started being more aggressive, had small losses, was trading on the edge of my comfort zone a little bit more. It was a great month, but for March, I think I want to taper it back a little bit. I really don’t expect myself to break $60,000 again in March. My goal for March would be 20,000. If I can do $20,000 a month, I’m happy. If I can do 40, that’s great. If I can do 50 or 60, that’s outstanding, but I don’t expect that I’m going to do $50,000 a month every single month this year. I think that February, we were in a hot streak. I got aggressive, I was able to capitalize on the opportunities. 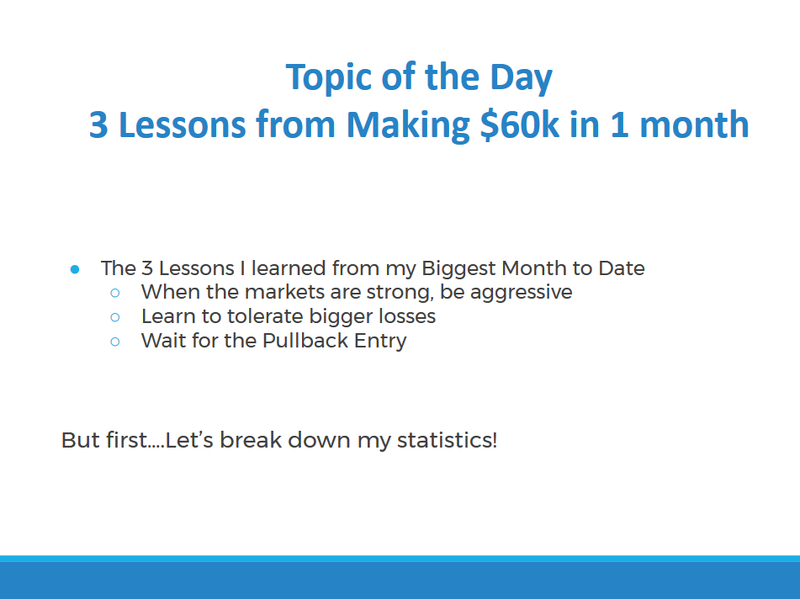 I had multiple 8 to $10,000 days and it’s not reasonable to expect that every single month. This week, $7500. If I can do that four weeks in a row, I’ll be in the 20’s, getting into the 30’s and that’s fine. That’s respectable. That is, after all, six figures a year. That’s a good salary, so that’s kind of an outline of some of the things that are on my mind for the month of March. Of course my goal is to get to 100 grand and that means I need to make another $20,000. Since I’m up right now 3700 on the month, I guess 23,000 is my monthly goal. That’s the bare minimum. That’s what I want to be at. Yeah. Hopefully we’ve got some good opportunities and maybe I can get into the 30’s or 40’s but I don’t need to set the bar quite that high because the only way I’m going to get there is by taking 10, 15, 18,000 share positions and I can only take that type of size on good quality setups like RNVA today. If I take that size on a bad setup, I’m going to lose 4 or $5000 trade. I don’t want to do that back to back to back. 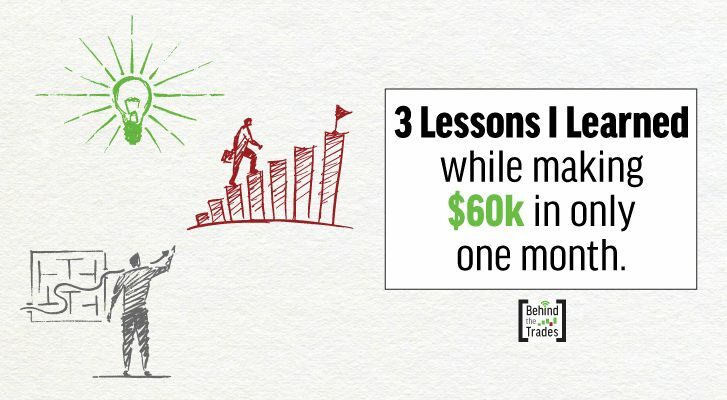 That wraps up the three lessons that I learned from the biggest month that I’ve ever had as a day trader, $60,000 in my small account, plus 8000 in my other account, so overall really impressive. 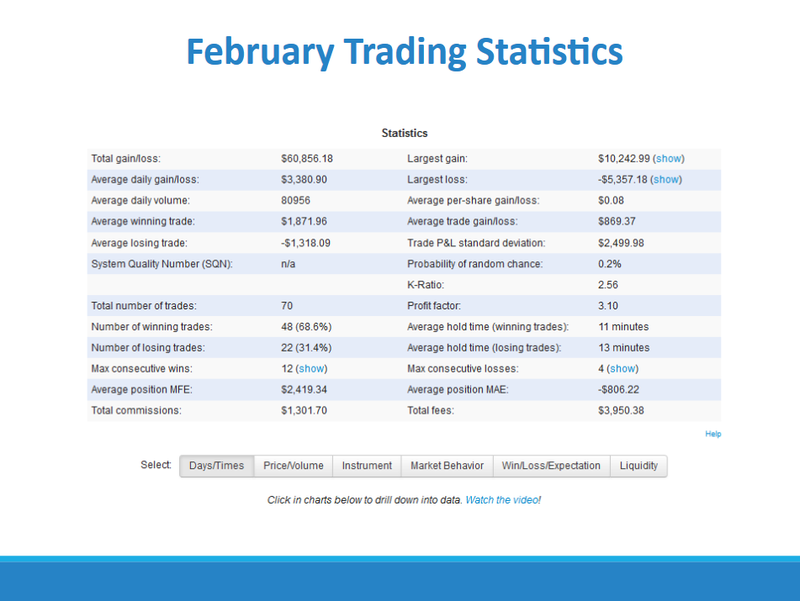 Now as we finish the month of February and came into March, and of course now I’m only trading in one account. I closed down my SureTrader account, so from here on out for the rest of the year, I’ll just be trading in my main account. I’d like to set up a retirement account that I can day trade in at some point, but I don’t know if I’ve got enough money put aside to do that. That’s something I’ll get to maybe this year, maybe not until next year, but from here on out, it’ll be SpeedTrader and you’ll see my statements uploaded on the website. You can find it, let’s see, right here. Scroll to the bottom of each page. It’s got the 2016 … I’ll add a link here for 2017. I guess I didn’t add that yet, but those are right up here, and the language is the same. You just change the date from 16 to 17 if you’re trying to find it. All right guys, so now let’s ask the Warrior. This is a little Q&A session for those of you watching on Facebook or for those of you hanging out here in the chatroom. I’ll get your questions answered. It’s some type of transaction fee. I’m not sure exactly what it is, but I guess something that is deducted as we go on each trade. All right, so regardless, almost regardless of the broker that you use, you can import trades here to Trader View. This is like 70 bucks a month or maybe 100 bucks a month, and you can go to “Import Trades” right here, and then you can select whichever broker you have. It’s pretty easy. Import your trades and then you’ve got all that info on them. 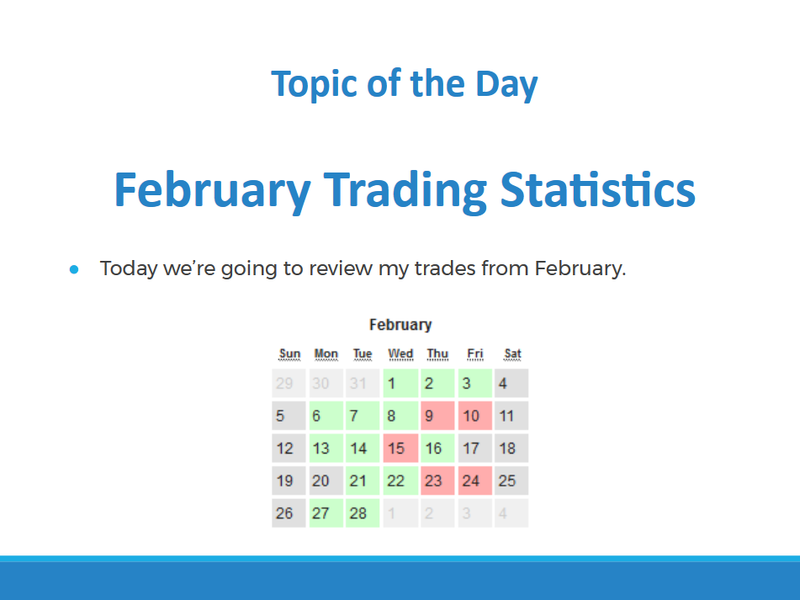 Now, bogged in, I’m not sure my metric’s based on individual strategies for the month of February because I wasn’t being diligent about tracking which strategy each trade was associated with, so unfortunately I wish I had a better answer, but yeah, I just, for whatever reason, I wasn’t tracking that. I actually haven’t been tracking that for awhile. It’s just one more thing to track. There was an article recently about a group of guys that were doing that, putting out really big bids and stuff like that. They must’ve gone through a dozen different brokers because each broker would see that they were doing this and shut down their account, so it’s not something that, number one it’s not legal. Number two, if you try to do it, you wouldn’t get away with it for long. Your broker would shut you down. Number three, if you put out a 40,000 share bid right here and you do get filled, someone wants to sell, you have the potential to lose a huge amount of money, so it’s just ridiculous but in any case, I saw the bid on the level two. It looked strong, and we popped up to a high of 27. Didn’t hold those levels, and so we ended up coming back down. In any case, I saw that using level two. David, yeah, the best way is to import your trades right into Trader View and I can give you some more info about how to do that if you’re not sure. George, “How do I read the exit indicators?” For me, each strategy has its own set of exit indicators. I talk about those as part of chapter six, seven and eight of the day trade course, but generally a good indicator is a red candle. If a candle looks like it’s going to close red, that’s usually an indicator to get out of the trade, so for me, I am watching the one minute chart and when I see a one minute candle go red, I’ll usually get out. Now, sometimes I’ll stay in if the setup looks relatively good. My first entry, let’s see, right here, I stayed in through this red candle and I had my stop at the low of the pullback but this was close. I was not feeling confident on it and I thought I was probably going to hit my max loss. Fortunately, though, it did bounce back. All right. Stop loss guidelines, , so the guideline that I use for the most part is a 20 cent hard stop. 10,000 shares is 2000 bucks, so maybe I don’t want to risk that much. I’ll start with 5000 and risk 20 cents. That’s 1000 bucks. If I can get a tighter stop, I will. Usually I can get tighter stops than 20 cents, but if I can’t then I’ll just size down. Let’s see. Yeah, I thought today, Nathan, also was going to be a day that I wasn’t going to find a trade. I think that I only had maybe one day of all of last year that I sat here looking for a trade and I didn’t find a single thing to trade, so it’s very rare to have a day where there’s just nothing I’m willing to trade. There are two things you can do. Number one is you say, “Look. There’s nothing good. I’m waiting til tomorrow.” Number two is that you say, “Well, there’s nothing that looks really good today so I’ll start looking at things that look so so.” That’s when you can get risky because now you’ve lowered your quality standard for what you’re willing to trade and that’s when you can start making mistakes. I try not to lower my quality standard based on the fact that the market isn’t very clean. I try to keep the high standard and it helps me have the best level of success. All right guys, so with that, I’ll wrap this up. Those of you that do still have questions, put them on YouTube in the comment section. I’ll answer them there, or put them on Facebook in the comment section and I’ll answer them there. I hope you guys all have a great weekend. Get some rest and we will be back at it first thing on Monday morning. All right, thanks guys!